Cancer can develop virtually anywhere in the body, from the head (brain, eyes) to the chest and abdomen, to the legs (osteosarcoma/bone cancer). Neuroblastoma (diagnosed usually in babies and young children) and leukemia are much more common among children than cancers of the brain, spine, bones or solid organs. Common or rare, pediatric surgeons and other cancer specialists at We Care India partner Children's hospital have the experience and expertise to address them all. The pediatric surgeons at We Care India partner Children's hospital are recognized worldwide as leaders in using minimally invasive surgical techniques to treat a variety of conditions in children, including some cancers. Because it uses much smaller incisions than traditional surgery, minimally invasive methods usually mean less pain, easier recovery, less scarring or disfiguring, and more normal growth after surgery. Whenever possible, surgeons here prefer minimally invasive surgery to remove solid tumors located virtually anywhere in the child's body. 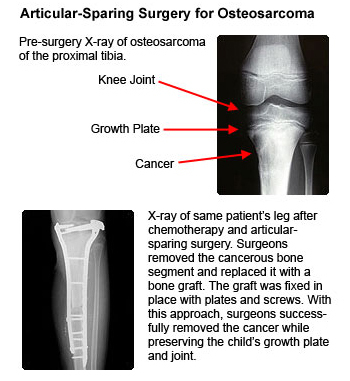 Surgery to remove tumors is the standard treatment for bone cancer (osteosarcoma). At many hospitals, that means amputation. At the We Care India partner hospital, we use innovative techniques to avoid amputation. More than 20 years ago, this was one of the first hospitals offering less radical limb-salvage methods as an alternative to amputation. Today, our pediatric orthopedic surgeons are among the first in India performing articular-sparing surgery - a refinement of the limb-salvage technique. This newest technique preserves as much of the child's own bone or joint as possible. Cadaver bone and tissue is then fitted to the child's natural bone like puzzle pieces -- resulting in a joint or limb that is even stronger and remains more stable as the child grows, and giving kids a better chance to be active after cancer surgery. Other physicians : - The surgeons work with many other pediatric physicians at We Care India partner Children's hospital to address childhood cancers. Pediatric medical oncologists, pediatric radiation oncologists and a pediatric neuroradiologist also are essential members of the cancer team. Other physicians who may be involved in a child's care include: neurologists specializing in neurofibromatosis, or tuberous sclerosis; nephrologists (kidney); hepatologists (liver); pathologists and neuropathologists; and many others.